Our FM Transmitter uses FM full-frequency wireless transmission technology which can directly read the audio files via the Bluetooth/TF card/U disk of the mobile phone. And Support Bluetooth audio playback and Bluetooth hands-free calling. 【3 Music Play Modes】A. Play music from Bluetooth-enabled devices via FM signal; B. Stream music from TF card, supporting music files like MP3; C. Stream music from U disk,supporting music files like MP3. 【Safe for Hands-free Call】 Built-in microphone frees your hand for calling. Easy to answer/hang up/reject a call/redial the last number/adjust volume via the multi-functional button. Moreover, compact design makes it space-saving and prevents from blocking gear stick for safe driving. 【Car Battery Voltage Display】 The FM transmitter will display car voltage when plugged into the car cigarette lighter. Enable you to know your car battery state easily. Then it will enter automatic play modes. 【2 USB Ports】 One is for USB music playing; the other 5V/3.1A USB charging port efficiently gets your iOS or Android device fully charged. Enjoy in-car stereo streaming and charge your smart device at the same time. 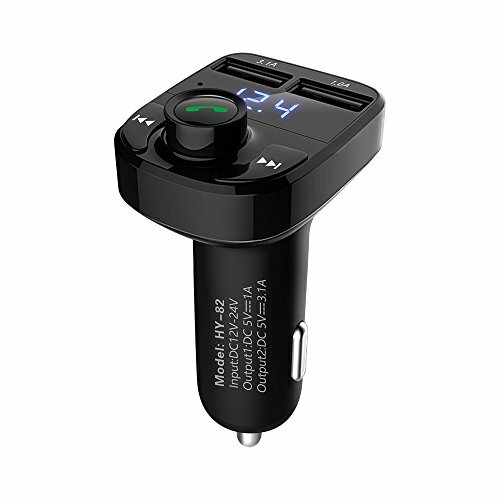 【Wide Compatibility with Aux Output】 Featuring Bluetooth 4.0 technology, FM transmitter is compatible with iPhone, iPad, iPod, tablet, and Android smart phones. Further, you can use the included 3.5mm audio cable to transmit music through Bluetooth if your car has aux-in port. If you have any questions about this product by Brosin, contact us by completing and submitting the form below. If you are looking for a specif part number, please include it with your message.